The Police in Lagos have apprehended a houseboy, identified as Mayowa Ogunmola, who sold his employer’s N10m Toyota Prado Land Cruiser for N50,000. FSARS Operatives had launched a search for the suspect after his employer, Femi Mayaki, a resident of Wiliam Care Street, Anthony Village, Lagos, on July 18, petitioned the Commissioner of Police Lagos State that Ogunmola made away with his Toyota Prado Land Cruiser Jeep containing personal documents. The suspect was eventually arrested at Ikorodu, Lagos – during interrogation, he confessed to the crime. He later took detectives to Ijeba-Ota, Ogun State where he claimed he gave the stolen car to one Femi Ayoade whom he asked to get a buyer for it. 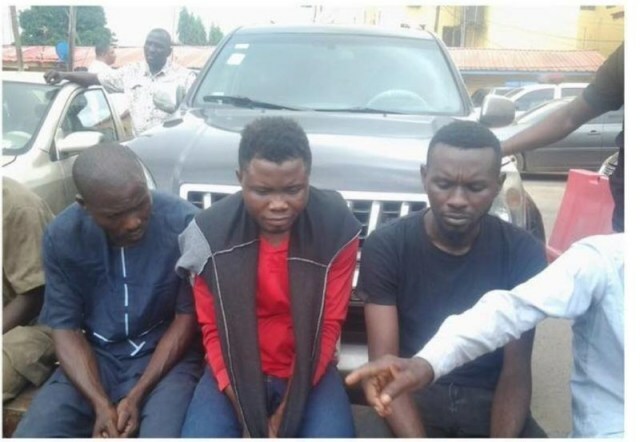 Femi, according to the police, was subsequently arrested and he confessed he sold the car to one Azeez Ibrahim, at the rate of N50,000 and led the Operatives to arrest Azeez Ibrahim and the stolen car was eventually recovered from him. All three suspects in the case are now in Police custody.